Iran has an extreme and arid climate. It can get very hot in the daytime and cool down considerably at night. Long before electricity and air conditioning were invented, back when Iran was called Persia, staying cool in these conditions required ingenuity; that’s how windcatchers were born. 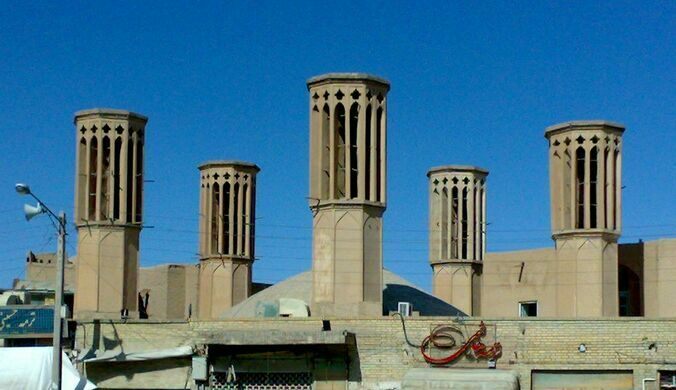 Windcatchers are a traditional Persian architectural design that creates natural ventilation in buildings. The basic design consists of a tower that rises from a building below, with openings at the top. 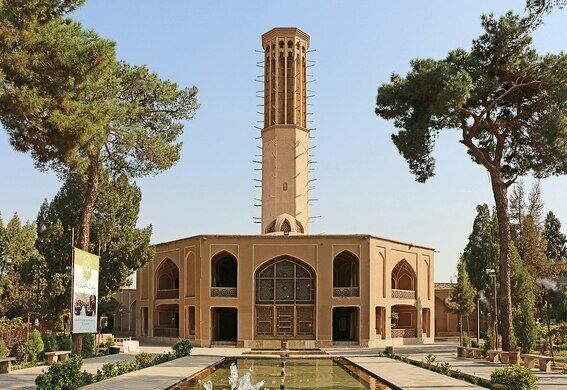 Yazd, one of the largest cities in Iran, is known as the “City of Windcatchers.” It has a very hot and dry climate, perfect for this type of cooling device. 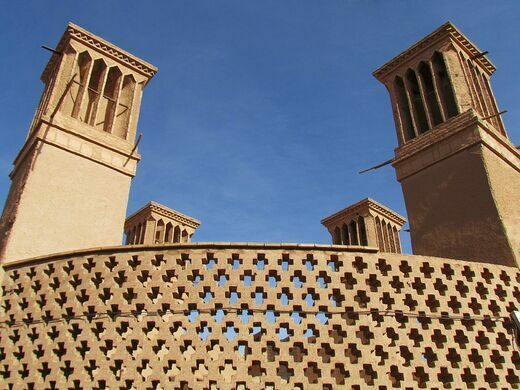 Many old buildings in Yazd were built with magnificent windcatchers. The tower of Dolat Abad is the tallest existing windcatcher in Iran. 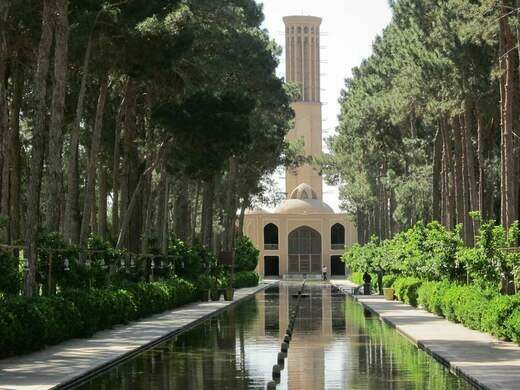 It rises from a building in the 18th-century Dolat Abad Garden, a jewel of the city. 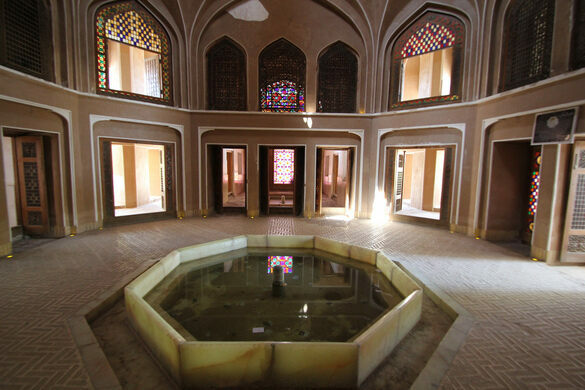 Yazd is also known for having a large network of qanats, which are underground channels that transfer water from a well to the surface. The windcatchers and qanats often worked together to create an amplified cooling effect. Windcatchers work in one of three ways. The most common way is to cool the inside of a building. The tower has openings that face the wind and “catch” it, creating airflow inside the structure. When used in combination with a qanat, air is drawn down into the qanat tunnel and comes in contact with the cooler earth and cold water. The cooled air is drawn up through the windcatcher, which faces away from the prevailing wind—not only creating airflow, but also cooling the air. In a windless environment, windcatchers operate like a solar chimney, allowing hot air, which is lighter, to flow upwards and escape out the top of the tower. Combined with thick adobe walls, windcatchers are surprisingly effective and able to chill lower-level spaces. Windcatchers can still be found throughout Iran and in several other countries in the Middle East and Persian Gulf.